Kerri Sackville is an Australian author whose first book, When My Husband Does the Dishes, was a light-hearted look at marriage after children. I read the book after going to a talk she gave as a guest author at my local library a few years ago. She seemed a charming and funny lady in person and her book was an entertaining read. I recently read her second book, The Little Book of Anxiety, and am impressed again at her generosity. There’s some wisdom, and compassion, and desire to educate in this book. She gives a lot of herself, explaining how it feels to suffer the intense anxiety and panic attacks that she has endured since childhood, and some observations of how her diagnosed anxiety disorder has impacted her family over the years. She discusses dating her future husband (they’ve since separated), her pregnancies and miscarriages, the births and raising of her children, and forging her writing career. She also describes a traumatic birth experience and her grief over her sister’s death from an illness. 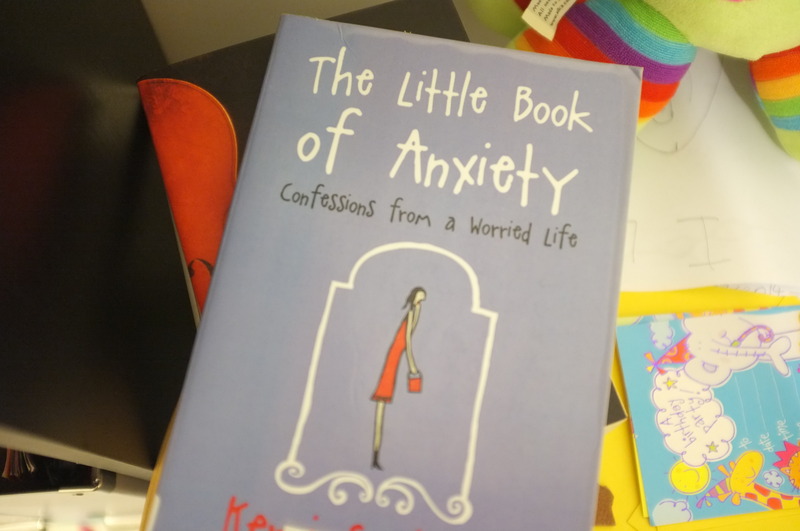 Still, Kerri is a comedic writer, and overall this is a funny book from the very beginning where she describes being too anxious to be able to think of ideas for her book about anxiety. I can identify with her anxiety issues a lot, and I think a lot of women would to some degree. But what is most interesting to me in this book is her confession about faith – the fact that although she strongly identifies with her Jewish heritage, she does not believe that there is a God. This is a heavy topic and I admire that she broaches it, indeed devoting considerable space to her position. I thought I’d share my reactions to her comments on why she can’t believe in God. Speaking from a Christian perspective, it’s assuming too much that faith in God removes worry from a person’s life, since even Jesus was anxious on the eve of his impending Passion. But is true that the person of faith is called to see the hand of a loving God in everything that happens. The story of Jesus bears this out best, and the people that the Church recognises as saints have lived from this perspective. Kerri mentions the problem that God’s existence cannot be proved or disproved logically, but appreciates that the God-question is one which can’t addressed on that level. “Faith isn’t logical, which is why it’s called faith,” she writes. “You either have it or you don’t, and sadly, I don’t”. It’s clear that what troubles her more than the lack of intellectual proof for God is the problem of the existence of suffering, particularly the suffering of innocent people, and she also questions the point of communicating with God. “If there is a God, He seems to have His own agenda, which is pretty much unswayed by human requests,” she writes. She doesn’t understand the prayer that “God’s will be done”. Kerri is right. But the understanding in the Christian tradition is that our prayer doesn’t change God, rather it changes us. We pray that we will allow God’s will to be done in us, that we step out of our narrow view of the way we think things should be and allow for a much broader, larger, perspective to come in. It’s a brave and humble prayer. This is something that believers have to remember – it’s easy to slip into the mode of trying to change God’s mind, to bargain, to request, to manipulate, rather than to sincerely ask (as Jesus did) that God’s will, not our own, be done. Finally, she describes what it feels like to not have faith in a loving God, with a scene where she almost died after giving birth. This is a very poignant image. Here she lays out her vulnerability, but also her pride in her self-sufficiency. Perhaps this is really the sticking point for her – that a belief in God involves a surrendering of oneself. She has suffered in life, and the suffering has made her stronger, more skilled at walking that tightrope. Perhaps with such hard-won resilience one might not be easily inclined to turn around and share the credit with God, especially when one doesn’t know him too well. My reaction to the image of the lone tightrope walker is that one doesn’t have to walk it alone, that God is there as a guide and support, and also that authentic belief in and dependency on God does not take away anything from a person. It doesn’t infantilise a person, it only adds to their richness – immeasurably. “I have come that they may have life, and have it to the full,” says Jesus. And, “The truth will set you free”. But some people simply can’t or don’t or won’t believe, for whatever reason. I’m not judging Kerri in any way, just responding to her comments from a position of faith. She seems to be a good person. I am much more sympathetic to her atheism than, say, Richard Dawkins’, who believes with the unreasonable faith of zealot that all religious faith is evil. Talk about illogical. Also, I would add that while a life lived with faith in God can be very consoling it can also be just as scary as walking a tightrope without a safety net. Jesus said that of those whom have been given much, much more is expected. We can forget the tightrope. I think he expects us to fly….. Thanks Marilyn, I liked that, and a heartfelt thank you for your faith. Hahaha, you know what I mean! This is simply my best read for this day. Thank you for sharing! My prayer in all that is to say 'Jesus I trust in You" It took me a long time to come to that. Actually many many years. …….Pat C…..
marilynrodrigues posted: "Kerri Sackville is an Australian author whose first book, When My Husband Does the Dishes, was a light-hearted look at marriage after children. I read the book after going to a talk she gave as a guest author at my local library a few years ago. She seeme"
It’s a beautiful prayer Pat. Thank you for sharing this book! I also struggle with a pretty severe anxiety disorder. I am sad she feels she can’t believe in God because then all of her worry problems would go away. I’ve always found strength in this passage from 2 Corinthians 12: ” 8 Three times I pleaded with the Lord to take it away from me. 9 But he said to me, “My grace is sufficient for you, for my power is made perfect in weakness.” Therefore I will boast all the more gladly about my weaknesses, so that Christ’s power may rest on me. 10 That is why, for Christ’s sake, I delight in weaknesses, in insults, in hardships, in persecutions, in difficulties. For when I am weak, then I am strong.” Anxiety and worry are always a struggle, but that doesn’t mean God isn’t present. Having an anxiety disorder has taught me things about myself and others and allowed me to empathize with people I would never have understood before. It’s difficult to call anxiety a blessing, but I don’t consider it to be without value. Thank you for your perspective, I admire anyone who lives with this. So glad I found this post! I’m also glad that you countered the belief of atheists that those who believe in God have less worry with patience and gentleness. Nicely done. He said that a trapeze artist can do beautiful and amazing things – but only if she lets go. She has to let go of the bar and fly through the air, trusting that she will be caught by the other. It’s a scary and daring thing to do, for there is no safety net. “Do something daring” he told me. Thanks for your comments Christina, and what a great priest!